The power of the footstep was given a modest inauguration by the shoes of the staff of the British Embassy in Washington DC at the end of 2016, supporting a revolutionary renewable energy technology developed by UK company Pavegen. 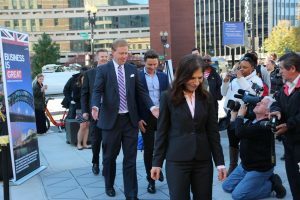 They joined pedestrians on Connecticut Avenue in the city to make their small but valuable contribution to powering outdoor street lighting, in a system that harnesses the energy generated by people’s feet. The installation of tiles, in a footway just south of Dupont Circle at the Connecticut Avenue Overlook pocket park, will provide energy for nearby interactive light installations. The energy from pedestrians’ footsteps will also power LED lighting underneath seating on the Golden Triangle, D.C.’s central business district. The project, the company’s first in the United States, uses Pavegen’s latest advance in its renewable energy-generating technology. Its triangular tile, the V3, is said to be far more efficient than the company’s previous models. As people walk on the floor, the weight of their footsteps makes a flywheel underneath the tile rotate, converting the downward force of a step into electricity. The flywheel turns at 1500 RPMs, generating almost 200 times more energy than the first version, launched in 2009.
in the earlier tile, where a foot might hit it in the wrong place and not generate any power. Each footstep produces up to 5 watts of power; so a single one can illuminate an LED-powered street lamp for 30 seconds. Clean-tech start-up Pavegen says the tiles will cost “around” the price of good quality flooring you might see in, for example, a train station. 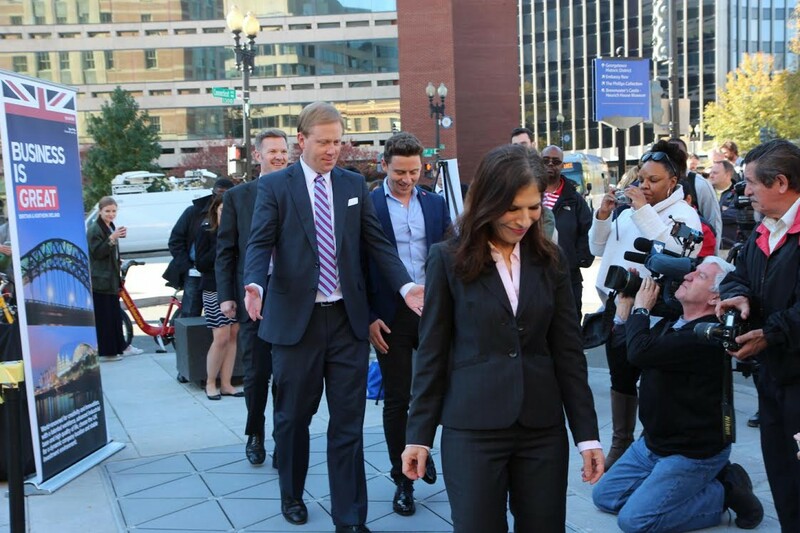 The joint venture between clean-tech Pavegen and the D.C. government is designed to power lights day and night, to improve visibility and increase pedestrian safety. The new paving is positioned in an area of high foot traffic. The tiles will also contain data tracking technology. The Golden Triangle website will show the number of steps, energy produced and where pedestrians walked, so that people can see the energy impact of their footsteps. In the UK the new Pavegen tiles will be installed at the Westfield shopping centre in Stratford, East London, and just off London’s Oxford Street (Bird Street). According to Pavegen, people do appear to seek the tiles out – assuming they recognise them. Research it has done shows pedestrians are 30% more likely to step on one of its slabs than a normal pavement tile. Laurence Kemball-Cook, founder and chief executive of Pavegen said expanding into the U.S. was one of the company’s biggest moves yet. Founded in 2009, his company has grown from a 5-man team to a 40-strong group of engineers, designers, and innovators around the world. In 2015 Pavegen broke its crowd-funding target and was able to fund expansion and product development. The earlier version of the tile is present at more than 100 sites, including Heathrow Airport and Harrods department store in London. One installation, on a football pitch in Nigeria, generates electricity when players step on them to provide some of the energy to floodlight the pitch. Previous PostA snowy, seasonal visit to New York City. Next PostThat Planet Earth sequence of baby turtles: who is really to blame?